The Maze Virus devastated Ireland. Spreading quickly, the infected almost instantaneously transformed into bloodthirsty killers who consumed the flesh of their intended victims. After much carnage and bloodshed, the Irish military was able to round up all of the surviving infected, putting them in a maximum security facility where doctors and scientists worked overtime to find a cure. They are successful, and after a few years 75 percent of those infected by the Maze Virus have been cured. One of the last to be released back into society, Senan (Sam Keeley) is lucky in that his American-born sister-in-law, Abbie (Ellen Page), is willing to welcome him back into her home as he finishes up treatment and continues to check in with the military officer (Stuart Graham) in charge of his case. Not nearly as lucky is Conor (Tom Vaughan-Lawlor). A former barrister who had harbored political ambitions, he was Senan’s closest confidant and friend while they were going through treatment, so now being stuck in a halfway house and being forced to work as a street cleaner is hardly how he saw his life turning out before he became infected by the Maze Virus. 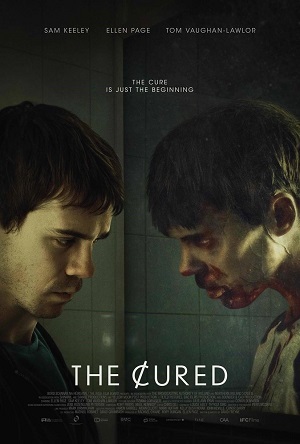 The debut feature from writer/director David Freyne, The Cured is a zombie what-if that basically wonders what would happen to society if those who had once been flesh-eating killers were freed from their affliction and then allowed to enter back into their day-to-day life as if nothing had happened. How would the uninfected feel about that? What would they do? As for the former zombies, would they remember what they had done? If so, how would they deal with that trauma? Would the knowledge that they were once killers who had inflicted pain and misery upon their own loved ones eat away at them until emotionally there was nothing left? These are fascinating questions, and Freyne works overtime to tie them into current debates in Europe and the United States regarding immigration and refugee policies, doing his best to show how hatred, bias and mistrust can have a devastating impact on entire nations if these feelings are allowed the opportunity to fester and spread into the mainstream. It’s an interesting idea, and while it isn’t exactly novel to take a horror story involving zombies and the end of the world and fill it with copious bits of biting social commentary (that was George A. Romero’s goal, after all, when he brought the genre into the mainstream with Night of the Living Dead), when things are handled this intelligently and with such conviction I tend to go easy on the film as a whole no matter if other shortcomings or missteps, no matter how egregious, eventually arise. Which is a good thing, because Freyne’s film is far from perfect, many of its subplots and secondary characters not well developed, most of them rendered in increasingly annoying shorthand which has the unfortunate side effect of lessening the tension and suspense a substantial amount. There’s also nowhere for the story itself to go that isn’t preordained. For all the novelty of the premise, and as nice and as sneakily intelligent an examination of the current immigration divide as this might be, as far as where things are headed involving Senan and Abbie there’s hardly a surprise to be found. 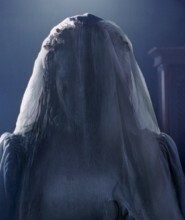 It’s such a foregone conclusion that even the slightly unnerving and creepily heartbreaking final image didn’t pack the power I felt Freyne was hoping to achieve, and as much as I respected the overall effort I cannot say I was engaged for all of the film’s methodically paced 95 minutes. But both Keeley and Page are very good in this, their relationship having a crafty, uncomforting ebb and flow that builds in power and intensity throughout the film. 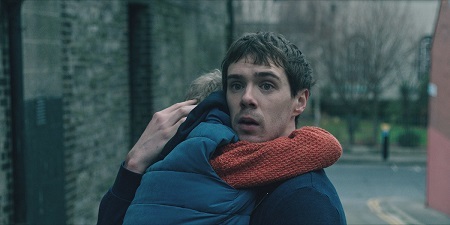 As for Vaughan-Lawlor, until the movie suddenly and mysteriously drops Conor out of the picture entirely the actor’s angrily frustrated performance is a thing of sinister beauty. The Maze Virus appears to have brought out the abhorrent machinations of the wannabe politician’s inner nature. As such, once he is cured these desires remain only now the unaffected portions of society, even members of his own family, refuse to give him the time of day let alone a platform to spout his views. The way in which Vaughan-Lawlor twists his character’s emotional reactions to these responses is increasingly disturbing, his inner beast emerging with such aggressively terrifying ferocity I was spellbound by all the actor was doing. I wish that I would have had more of a heart-stopping emotional response to the film that mirrored my reaction to Vaughan-Lawlor. I appreciated the strength and cleverness of Freyne’s scenario, and I was certainly captivated by everything Senan and Abbie were going through. But the basic thrust of the actual plot progressions were so unrelentingly predictable I couldn’t help but be moderately underwhelmed by where things ended up. As debuts go The Cured is still a strong one, and I’m curious to see what Freyne has up his sleeve next. But while I do feel like those intrigued by the scenario will likely be satisfied, for my part I still couldn’t help but want for more, the end result leaving in a state of restrained indifference that caught me somewhat off guard.